I have managed to mostly avoid playing MMOs since, mmm, January of this year, which has done wonders for my backlog and for my self-esteem in general. I am far too prone to getting in to the loop of grinding and gearing and eventually burning out and wondering what I’ve been doing with my life. That said, I’ve also been sick for the last week and En Masse Entertainment keeps sending me invitations to come back for a bonus XP event, with the added carrot being that, if I got a character to the level cap (65) I would get a pegasus of my very own. 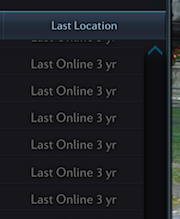 I last played in 2014, when the level cap was 60, so it didn’t seem like that was too much of a challenge… and Tera’s berserker class is the ultimate in low-brainpower-required classes, to the point where you can credibly run through solo quests by alternating between two of your damage skills. I did manage to get myself killed a few times doing this, by the way. Among the many changes that have happened in the last three years was a complete revamp of the potion system, so most of the healing items I had stockpiled in inventory were marked as “this item is no longer usable” and I wasn’t feeling smart enough to figure out where to go to get new healing items. Instead, I logged in, got the breadcrumb quest to take me from level 60 to the new-to-me post-60 region, and started killing ten rats, some of which returned the favor. That’s a little unfair to the game, I admit. The post-60 story is actually a pretty neat affair, where you are part of an airship crew tasked with breaking through a massive storm barrier that has sealed off one part of a continent for centuries and finding out what is behind the barrier, and I actually felt pretty good about my role in it once it was all over. But there was a lot of killing of rats, even if the rats were massive biomechanical knights. 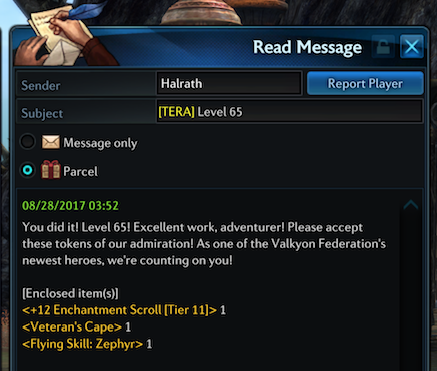 I also made my goal of level 65 and reaped the promised rewards with glee. I have to give En Masse / Bluehole some credit for the quality of life changes that they’ve made in the last three years. There’s a lot less nonsense in the gear enchanting system, and the changes I mentioned to the potion system makes it seem like you don’t need to carry around the same crazy number of consumables as you used to. I didn’t feel ridiculously lost, which is a nice feat for a game I haven’t played in three years. And oh my word it is a pretty game. It did occasionally complain about running out of texture memory and needing to load lower-resolution textures, which isn’t something I’m used to seeing with a 4GB card, but the payoff for being a bit of a hog is some really beautiful fantasy landscapes. It really makes me want to see more of it. …and I’m not sure I’m up to the task of building up a social network again. This entry was posted in MMORPG, PC Gaming, Tera, videogames. Bookmark the permalink.